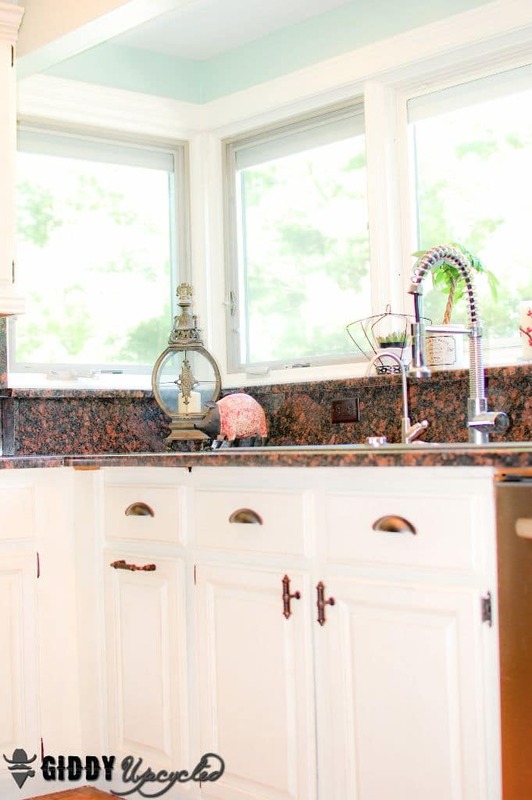 When we bought our house 2 years ago, I absolutely fell in love with the kitchen – or I should say, the potential of the kitchen. 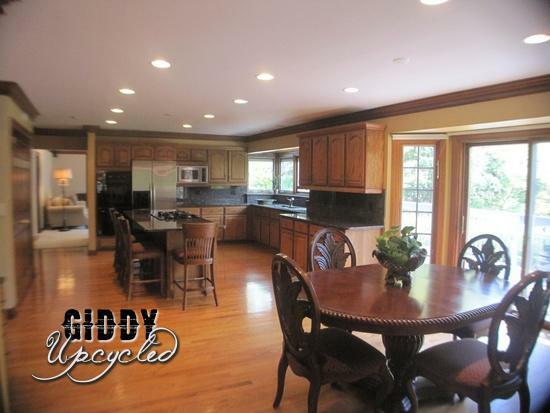 First, its a very large kitchen – lots of open space, and lots of natural light. I can look out the kitchen windows, and see my kids playing in the backyard – wherever they are. Its got a great bay type window over the sink, that is just gorgeous. When we bought the house, we thought – we’ll just get new cabinets, piece of cake. What we weren’t really thinking about, is that in our large kitchen, there are 63 door faces – that is 27 drawers and 36 cabinet doors. 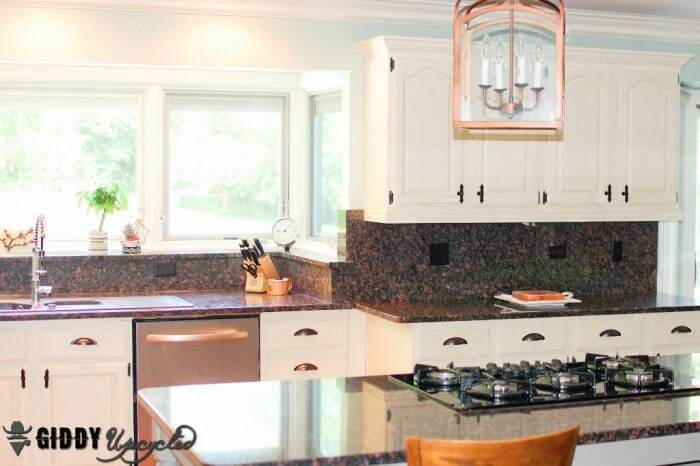 First we did a quick call with our local Home Depot store and after giving them a rough idea of our space and how many cabinets we have – we had quotes in the range of $40,000-50,000 for new cabinets, installation, the whole bit. Then we looked into cabinet resurfacing – where we’d keep our existing cabinet bases, and get all new doors. That came in at around $14,000, including hardware and hinges and everything. So we waited a year, thinking maybe we’d grow attached to the kitchen. 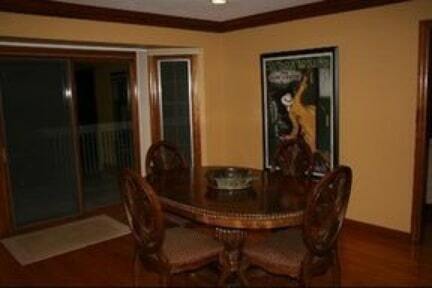 And with every waking day, I hated the color in the kitchen more and more. The color and the feeling in the room was so depressing to me. 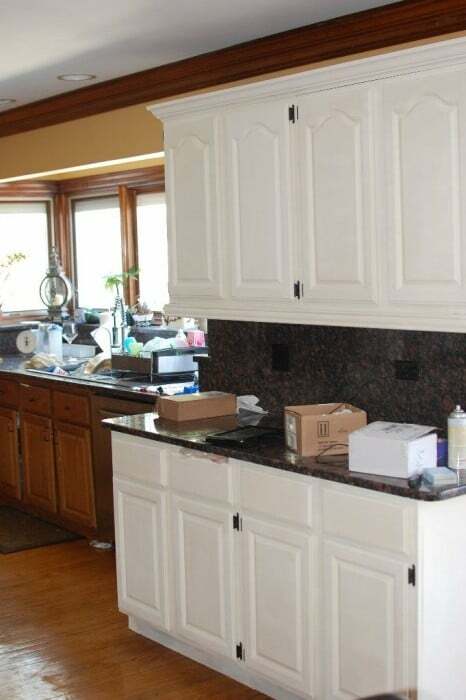 Until one day I woke up and decided I was painting the cabinets myself, and by the end of the day, SOMETHING in this kitchen would not be oak or mustard colored. No Sanding: The sheer number of cabinets that I had to paint, the thought of sanding them all down and then priming, and then painting was exhausting. 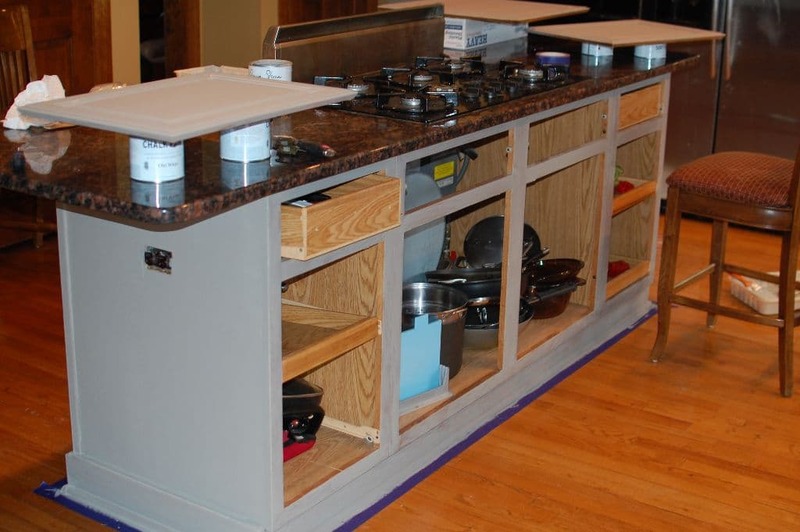 Dry time: if I had not used chalk paint, I probably would have gone with a oil based paint which takes FOREVER to dry, and would have probably taken me 6 months to get through all the cabinets I had to do. 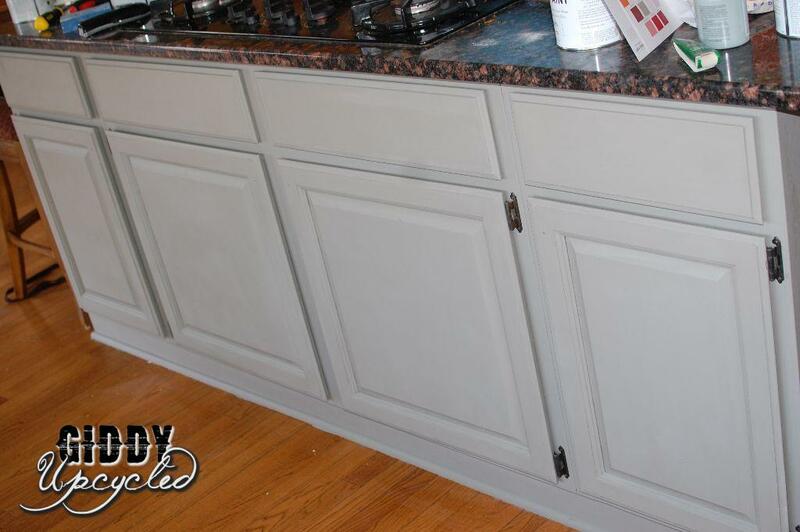 With Annie Sloan, I could do a section of 8-12 cabinets at a time, and by the time I was done with a coat on all 8, the first one was just about dry and ready for a second coat. 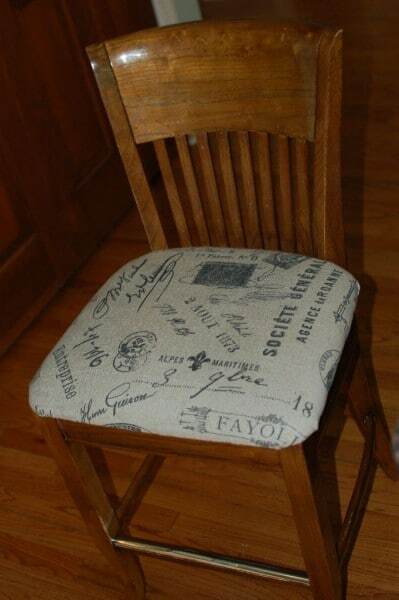 Finish: I was going for a more rustic/distressed look, which is exactly what AS paint lends itself to. Now for the details!! At the end of this post, I broke down all the details of exactly what we added, what we purchased, and exactly how much was spent. I removed all of the doors, hinges and knobs, and gave everything a quick rub down with a deglosser (these are 30 year old cabinets y’all!). I got lazy with the deglosser after this, since I had to shellac my main cabinets, I only used the deglosser on the island . I had looked into getting new hinges, but they were like $2 each, meaning $4 per door, for like 37 doors – I was NOT paying ~$200 on new hinges. 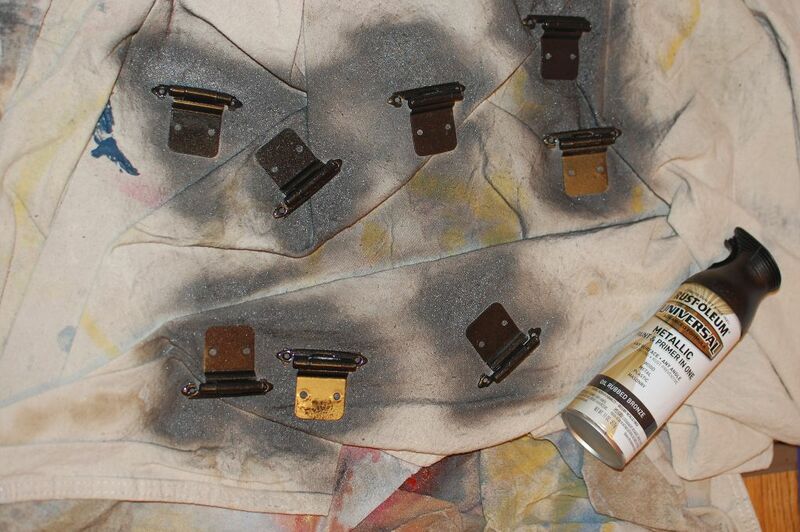 So I bought a can of my favorite Rustoleum Oil Rubbed Bronze Spray Paint, and hit up every one of the existing hinges with it. And it turned out amazing, I don’t think anyone would ever know they weren’t the new $4 per set hinges. First I painted the outside of the island, and then hit the doors. Hallelujah to Chalk Paint! Painting the entire island – 2 coats of paint took me about 2.5 hours in total!! I was pumped. Day 2, it was time to move onto the cabinets and I COULD. NOT. WAIT. Because my kitchen is pretty big, I opted to tackle it section by section, so that I could see some level of improvement as I went along. 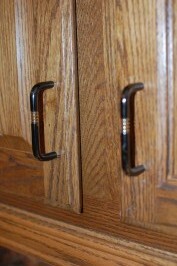 Before I go any further, I should add a note for anyone who might be considering painting aged oak cabinets. While Annie Sloan paint is awesome in that you don’t have to sand or prime, I did find that I had one step to do, before I could paint – especially since I was using white paint (I did not have to take these steps on my island, which I think has slightly newer cabinets, and I used the darker French Grey color there). 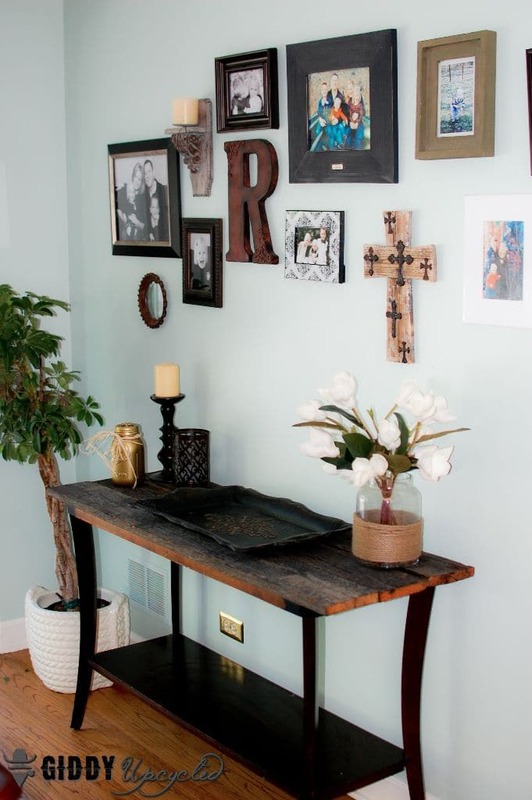 If you add your first coat of chalk paint, and see what looks like grease stains coming through the chalk paint, then you’ll need to do this as well. 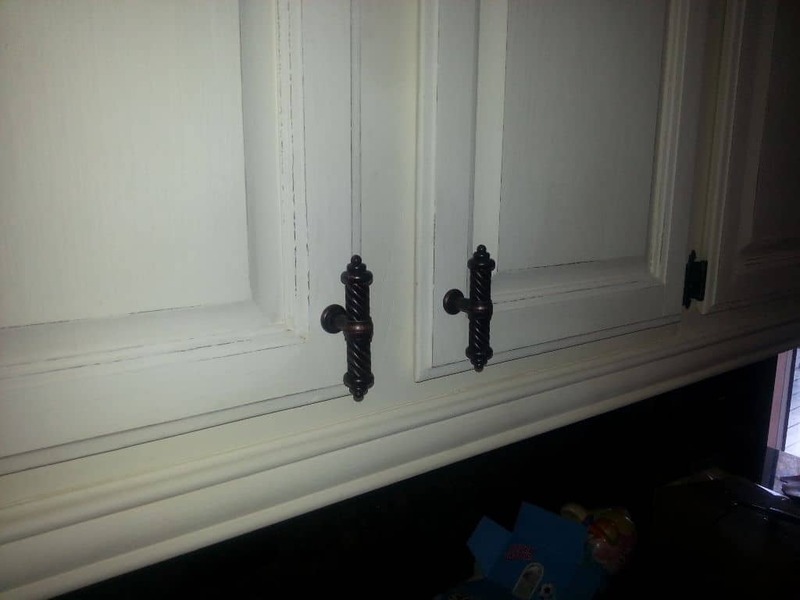 Because my cabinets are 30 years old, much of their original glossy coating/varnish has worn off, and there is basically somewhat bare stain sitting on top of the cabinets. 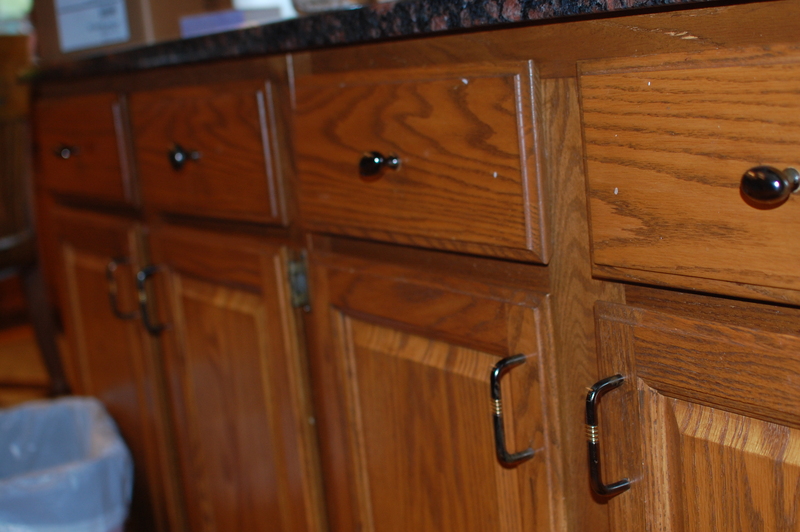 If your cabinets are dark grained oak and are pretty old, then you will likely need to seal in the original stain with Shellac before painting. Depending on how much stain is coming through, you might need 2 or 3 coats of shellac. The nice part is, it can be applied at any point during the process. There were a couple of doors that I put one coat on, and then one coat of Annie Sloan, so then I added another coat of Shellac and then redid the Annie Sloan. You do not need to remove the chalk paint that has been previously applied, you just Shellac at whatever point you realize you are still getting bleed through. 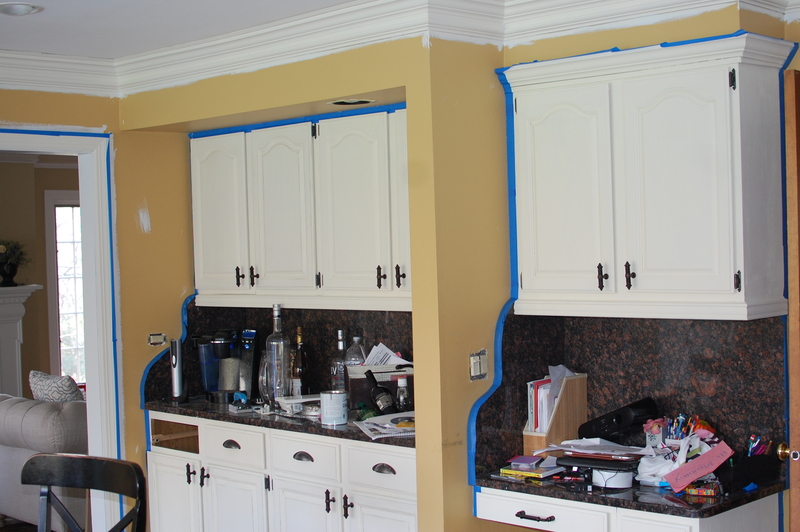 Thankfully it goes on quickly, and dries quickly, so its not a huge pain, but is definitely needed if you’ve got old, grainy oak cabinets like mine (especially are using a very light color of paint). The only other prep work I did was to wood fill and sand the existing hardware holes, since I was going to get new hardware. OMG, the orange is gone!! Its white and bright, and its BEAUTIFUL!!!! About 3/4 of the way through the painting process, my new pulls arrived in the mail, and I was in LOVE!!! 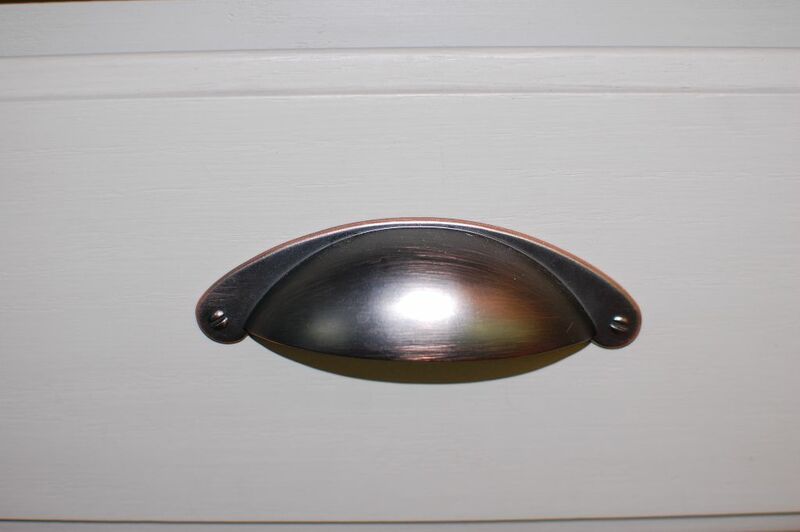 I had found some pulls online that I really liked, made by topknobs.com, but they were like $17 a piece. I was determined to find something like them, when I finally found a knock off version on another site for only $3.50 each!!!!! Since I had to buy 67 total pulls, I had to watch my budget there, a lot. I began installing them the minute they arrived. 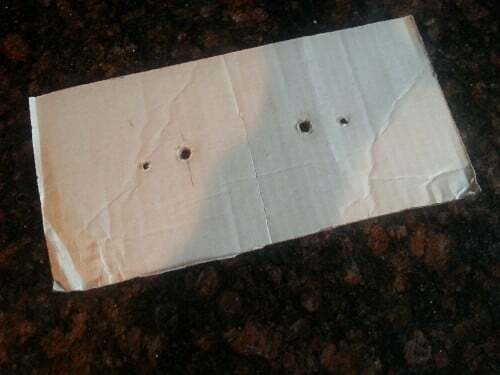 One little tip for installing hardware pulls, especially if you have a lot to do – use some cardboard to create a form of where your holes will go in comparison to your drawer. This saved a TON of time and made sure that my pulls were all the same distance from the top of each drawer. The rest of the cabinets took me about 2 weeks to do – painting mostly in the evenings and weekends – not bad at all considering there are 63 cabinets! 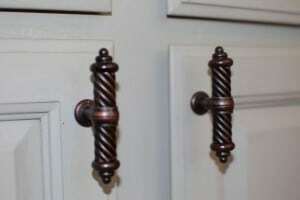 Once the cabinets were done painting, I gave them all 2 coats of Annie Sloan clear wax. I had tried to do some distressing using the dark wax, but didn’t really like how it turned out, so I wiped if all off and just distressed the edges of my cabinets with my sanding block – it was just enough to give it some depth and texture, while maintaining a clean look from a distance. 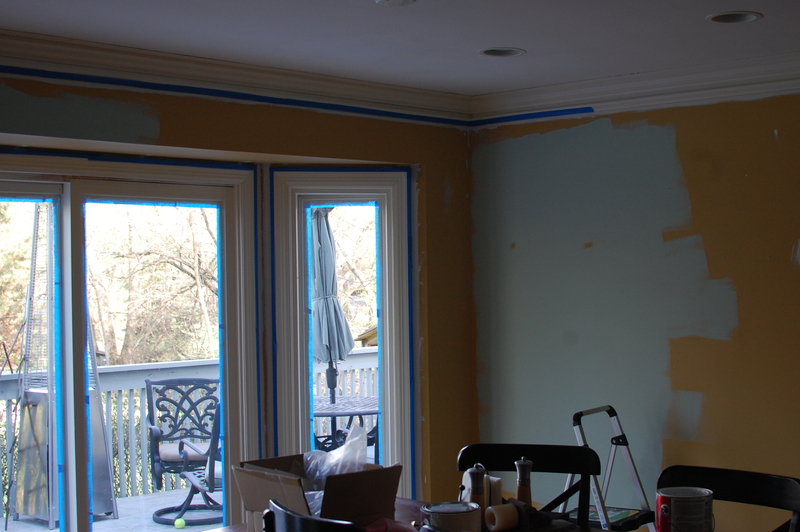 Next I was onto the trim and walls. I hit our wood crown moulding and trim with some Benjamin Moore Oil Based Trim paint which had been left by the previous owners – holy cow it was GOOD paint. 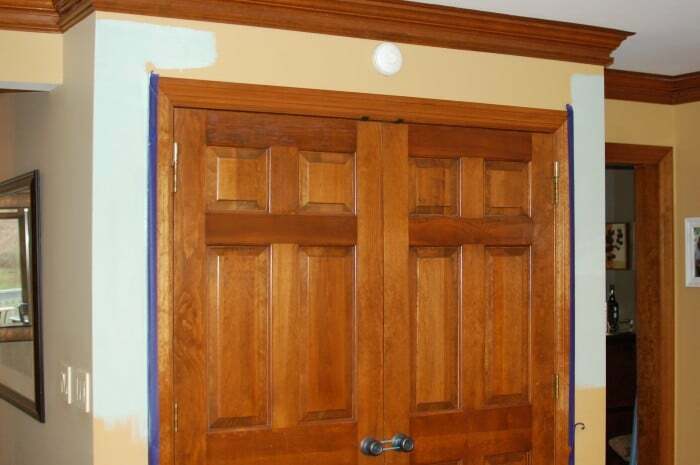 I had to go buy more and didn’t want to spend the $80 on a can just for one last coat on the trim, so they talked me into getting the Benjamin Moore Regal Select Pearl Finish, and it just wasn’t the same. It was much thinner and didn’t provide nearly as good of coverage of the oil based trim paint. Oh well, live and learn, right? 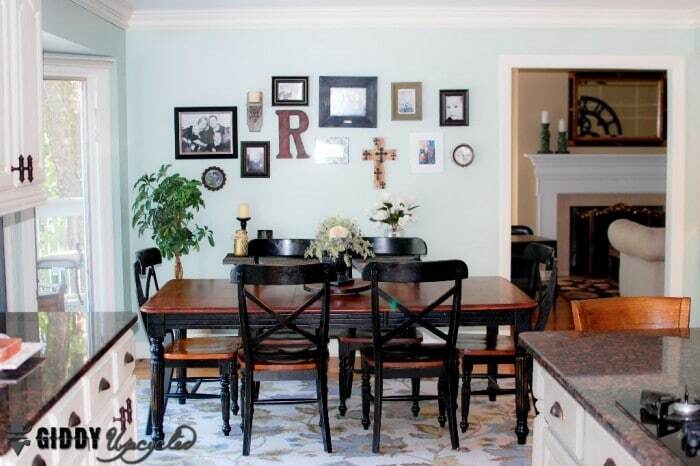 I tinted all of the trim to Benjamin Moore’s “Linen White” which was a fantastic match for the Annie Sloan Old White, and really softened the look of the trim. My other great steal was the wall paint. I had picked out this shade of Mint called Jade something (I can’t remember the exact name at the moment) by Behr for the kitchen walls. I go in to buy it, and as I’m walking by the stand with all their “whoops” paint, there is a can sitting there that is the EXACT shade I’m looking for, in their Behr premium paint. I couldn’t believe it, I even had him paint it on my sample and you could barely tell it was a custom shade. Only $7 for marquee paint for my kitchen walls, whoop whoop!!! After only 3 weeks at it, my kitchen painting job was done!!! I invested in a super cool new bronze chandelier to go over our kitchen island. I also gave our island a makeover by adding some trim and legs to it which adds a ton of character and really classes it up (I’ll detail that in a follow up post as it was a whole project in itself). I found a steal of a rug at Target that fit our coloring and the size of the room perfectly – it was originally $299 and was on super clearance for only 47 bucks!!!!! 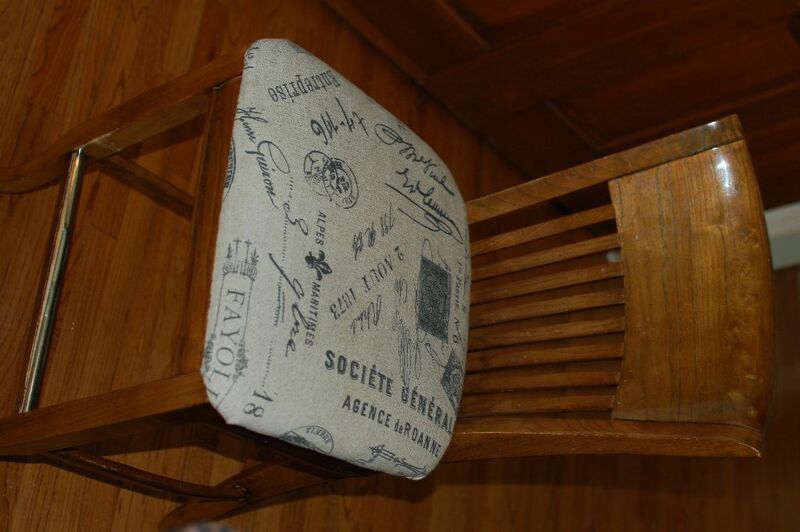 I also reupholstered the island chairs with a more fitting fabric (the previous fabric was dark red and mustard plaid). I may eventually repaint or do something with the wood on the chairs, but for now I don’t mind the look of a little bit of wood in the kitchen. By the time I got to the chairs, I was a little burnt out from painting so maybe down the road I’ll look into it, but for now, I don’t mind them. So without further ado, here are the official “after” photos!!! I am SOOO in love with it. Its been like 3 months, and I still walk into my kitchen and its so bright and cheery and just happy, it makes me smile all the time, and I still can’t believe what a dramatic transformation it was. Enjoy!! A good friend of mine was in my kitchen a few weeks later, checking it out for the first time. 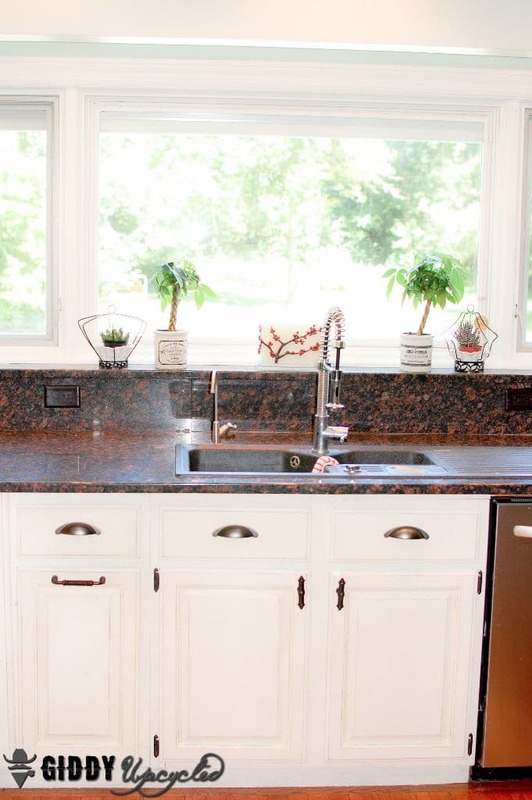 She told me her parents had just done a $50,000 upgrade to their kitchen a few weeks prior, and to her untrained eye, she couldn’t tell the difference between her parents hand antiqued off white kitchen cabinets, and my DIY, on the cheap, makeover. I call that a win!!! 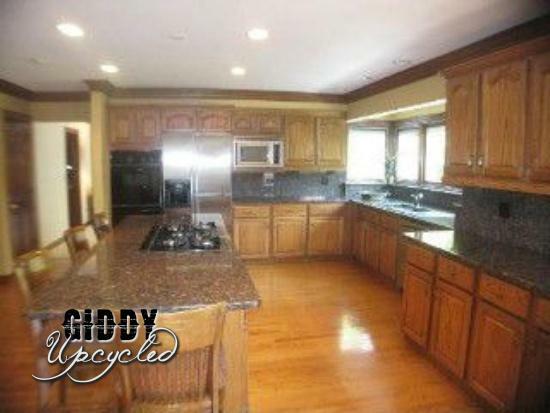 Total Cost for My Kitchen Makeover: $1024.47!! Score! You did a great job. I’m a very thrifty person too. Just bought my forever home. I asked my husband if he knew how many hinges were in our kitchen. 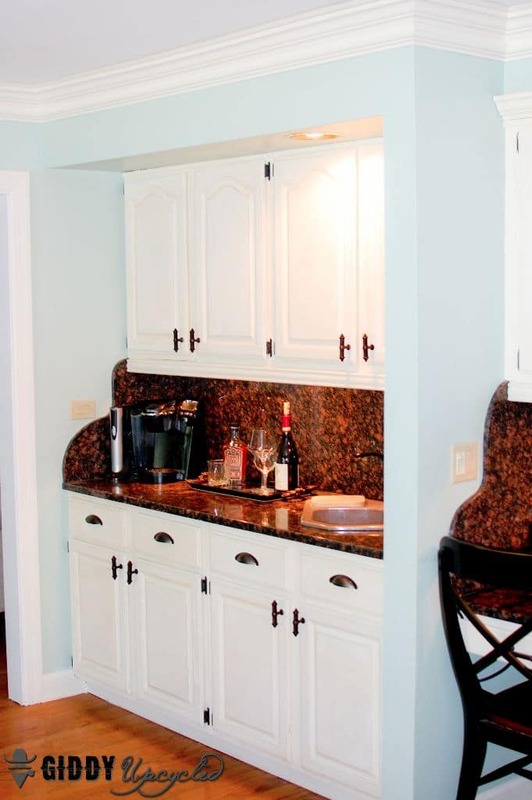 The last owner painted the cabinets AND the hinges *sigh* there’s 68! I love the way the paint turned out, we will likely paint again. If you could remember the website for the pulls, that would be awesome. 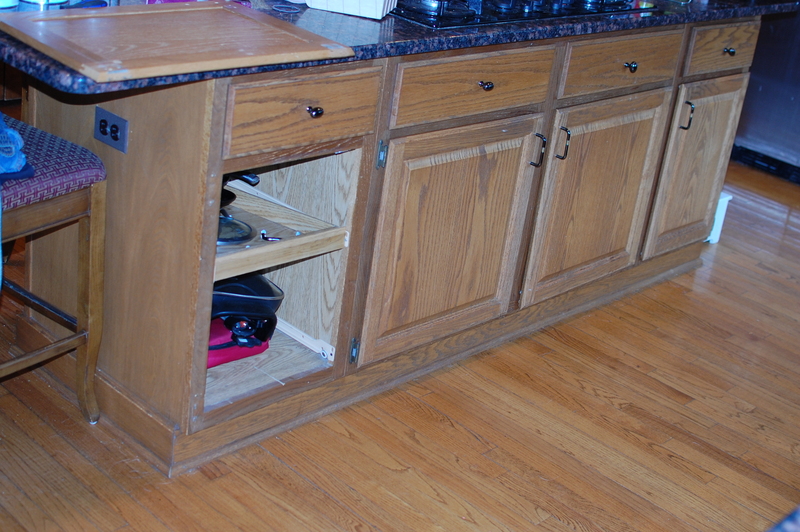 Also, do you know anything about refinishing laminate countertops? We have the original 1959 white with gold speckles lol. Even just replacing with new laminate will be $3500 🙁 I splurged and had the 50s pink tile bathroom remodeled, so anything done to the fabulous kitchen will be diy or nothing. The website for the pulls was ebuilderdirect.com – they were GREAT! Haven’t done laminate countertops before, but I’ve heard pretty decent reviews on the countertop renovations product that I think they sell at Home Depot. Maybe that would work for you? 🙂 Hope that helps! Absolutely FANTASTIC!!!!!! Love the new look – it must be such a great feeling to walk in there everyday and see how all of your hard work paid off. Enjoy your new space, it’s lovely!! Absolutely gorgeous, Ashley! That was a huge job, so impressive! Your kitchen doesn’t look like the same space. I’m about to begin painting my 80s orange cabinets and couldn’t decide on whether or not to use the chalk paint but you’ve definitely convinced me! I was thinking about trying AS Pure White but your supply list shows an AS Antique White which I am not familiar with. Did you mean the AS Old White? Thanks! Your kitchen turned out beautiful! 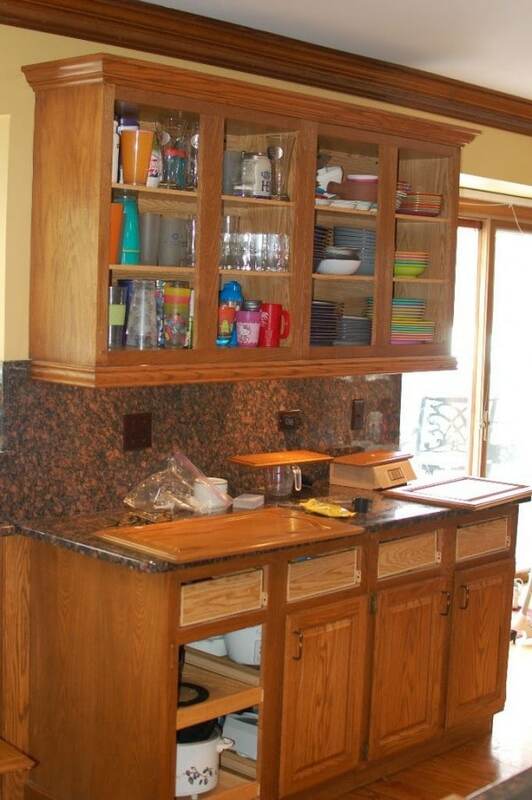 I’m considering painting our kitchen cabinets and love the idea of not having to sand. How is the AS paint holding up so far? We have six kids so we are hard on our home! I’m wondering how much chipping I will get with the AS paint. This looks awesome. I’ve been thinking about using chalk paint on my (also from the 90’s) kitchen cabinets and I love seeing how beautifully yours turned out. 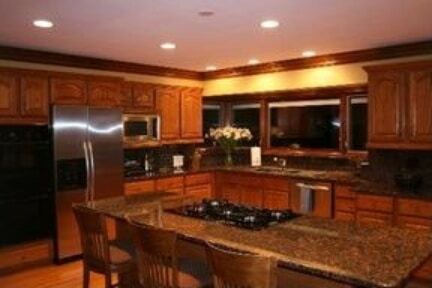 Hi Ashley, Your kitchen is gorgeous!!! I’m starting mine soon and I have the EXACT same cabinets as you. Thank you for sharing your work. Did you use brushes for the paint and did they leave brush strokes? Did a desk with AS paint and on the top it left brush strokes. Not sure how to avoid them. Beautiful job! Did you have to traet the metal hinges for the paint to stick? I’m thinking about painting my knobs and pulls. Just beautiful! 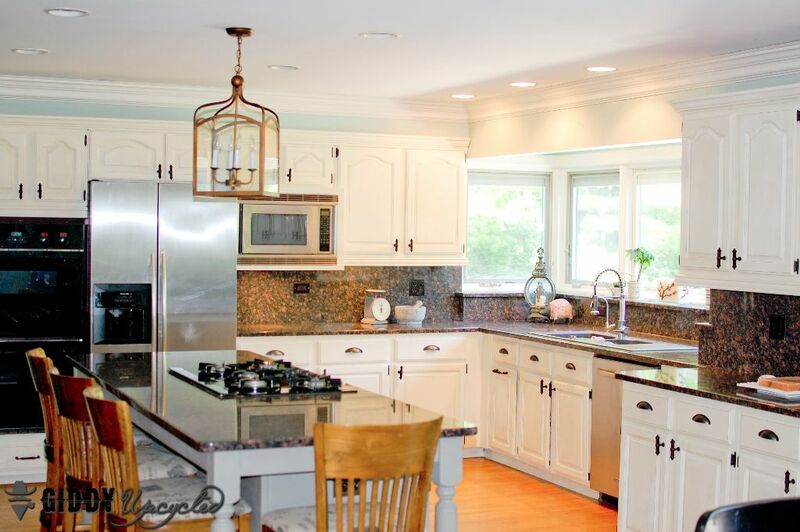 What a makeover into such a bright, clean, airy kitchen! I admire your perseverance, that’s a lot of painting! What a frantastic job you’ve done. Thank you so much for sharing your tips and materials. Like you I have wooden cabinets in my condo kitchen (1981). 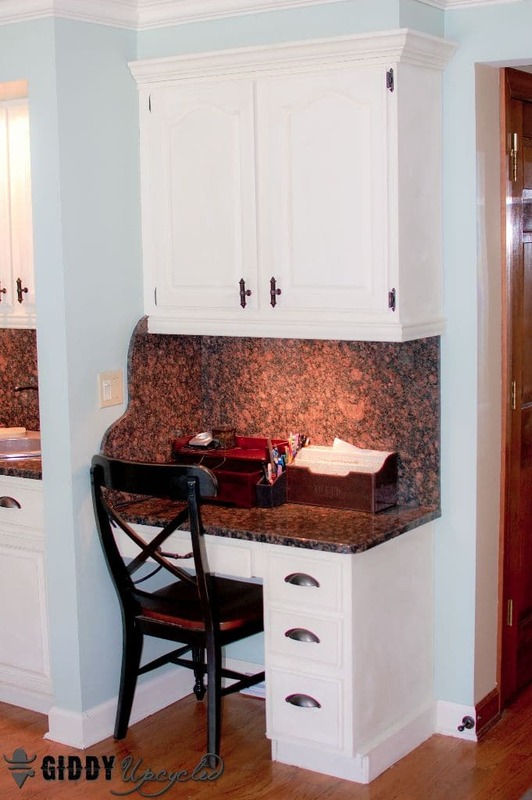 I like wood but being a small room I thought white cabinets would make it appear both brighter and bigger. Seeing your transformation I am trying to work up the motivation to change mine too. At least it will be only one third the task you had. Wow!!! Awesome Amaizing! You really nailed it, I love the transformation and the colors you chose. Looks like you spent thousands instead of just 1 thousand. I love it!!! o my gosh!!! 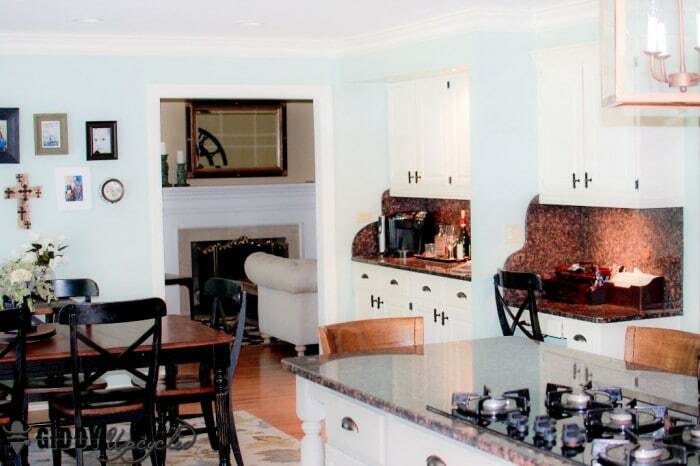 This is my current kitchen but not as large as yours but wow this is exactly what I am wanting to do !!! Exactly !!! 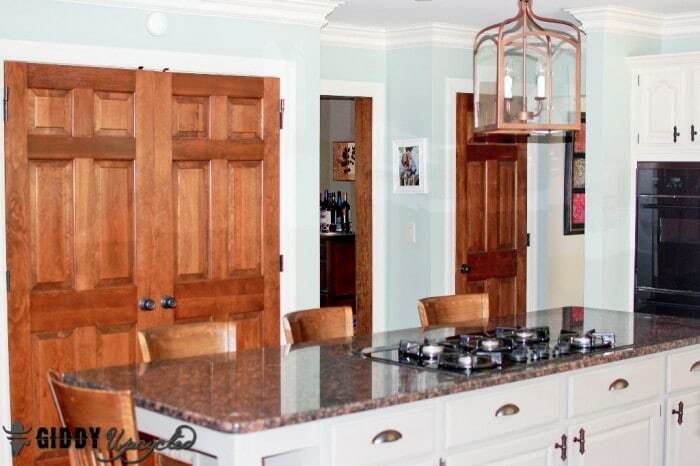 I am just needing to know the exact color for the cabinets themselves .. was it the Linen White by Benjamin Moore or the Anne Sloan’s chalk paint ? This is so exciting and you did a marvelous job! It looks fantastic ! !